Miryam Bendicoff is a classically trained Jewish educator with an MA degree in Jewish Education from the University of Maryland. For over a decade, Miryam has been teaching and tutoring Jewish students from all denominations in preparation for their B’nai Mitzvah. 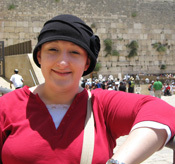 She is trained in the common tunes for Prayer, Torah reading and Haftorah, thanks to the skills passed down from generations of rabbis in her family. She looks forward to using the newly available technologies to help spread Jewish knowledge further than was ever before possible. Simply sign up for a free membership on Skype which allows for online live video chat. You will need a microphone and speakers or headphones for your computer, however, webcams are optional. You will be able to view the tutor, whether or not you have access to a webcam. Lessons will be 30 minutes in duration and it is recommended to schedule one lesson per week. Adequate practice time between lessons will help your newly acquired skills “sink in” as you progress in learning your Haftarah. You will be able to download and print any documents used during lessons. All lessons will be pre-paid with times to be arranged via E-mail. For further details, please contact Miryam Bendicoff by email.